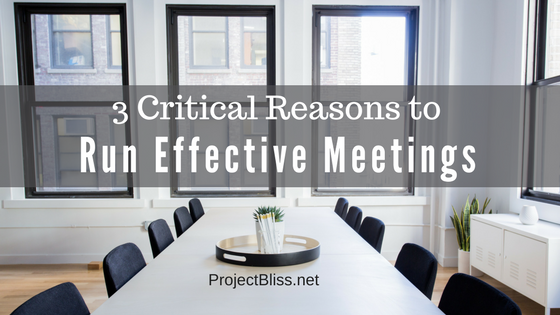 Effective meetings don’t just happen. It takes effort. And for that reason, you might be tempted to skip the prep work needed for a great meeting. It’s easy to simply send out invitations and walk into the conference room at meeting time. But you’d be making a big mistake and missing valuable opportunities. There are three big reasons why running effective meetings is more important than you think…. 1. Running effective meetings is a great way to showcase your leadership skills. Running a meeting gives you an opportunity to show your peers and leaders that you can be trusted to lead. Even if you’re not in a formal leadership position, facilitating a meeting gives you the chance to show others that you have valuable leadership skills. 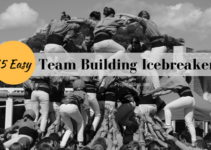 To run a meeting well, you need to prepare, coordinate resources, collaborate with others, communicate well, and follow up with action items and next steps. You show that you can be trusted to be accountable and responsible. You also let others know that you take the project seriously and can be trusted to take on more responsibility. Many people don’t take the time or put in the up-front effort often needed to run effective meetings. When you do, your meeting will be more productive and attendees will appreciate it. People notice whether you run your meeting well or not. Take the extra time and effort to do it well and demonstrate your leadership skills. 2. The cost of running meetings is higher than you think. Keep in mind that you’re not only using one hour for your hour-long meeting. If you have five meeting attendees, your meeting costs five hours. If you have ten attendees, your meeting costs ten hours. 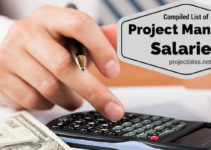 To get the actual cost of your meeting, add the hourly salary for each attendee. By using a meeting calculator, you can figure the cost of your meetings. If you hold an hour-long meeting with five people who each make $50,000 per year, the meeting cost is $175.00. If you hold an hour-long meeting with 5 people who make an annual salary of $100,000, then the cost for that hour-long meeting is $350.00. And if you hold that same hour-long meeting every week for a year, the annual cost is $18,200. So you better make it count. You can never recover that time lost in an unproductive meeting. And time is one of our most precious resources. There’s also an opportunity cost of running unproductive meetings. When attendees are sitting in your unproductive meeting, they’re unable to do other valuable activities. People often complain about not having enough time to do everything they need to do. Don’t be disrespectful of others and use their time poorly. If they don’t complete everything they need to during the regular workday, they often have to work longer hours. By asking them to sit in a meeting that wastes time, you may be asking them to cut into their personal time to get other things done. Keep this in mind. 3. Effective meetings are a great way to move your project forward. After considering the high cost of meetings, you may be tempted to do away with them altogether. But consider that effective meetings are great for moving a project forward. They’re an efficient way to bring a group of key people together to make a decision or solve a problem. It’s far more efficient to hold a discussion in a meeting and come to a decision than to carry it out over days via email. But keep in mind the purpose of your meeting and hold the right kind of meeting with the appropriate attendees. Plan your meeting around the goal to make sure you hold the most effective meeting possible. 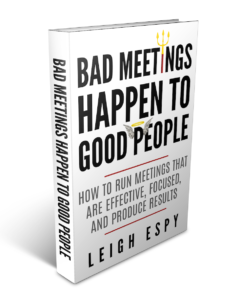 To learn more about running great meetings, you can use my book Bad Meetings Happen to Good People: How to Run Meetings That Are Effective, Focused, and Produce Results. 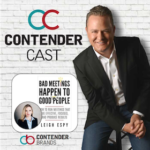 I was fortunate to be interviewed by Justin Honaman on the Contendercast Podcast. He’s a wonderful interviewer with great topics and guests, so I’m grateful for being given the opportunity. I highly recommend his podcast!